It's always unintentional, but before every party I have at my house, I come up with a project that just has to be completed before the big day. Tadd's not a fan of this, as he's usually the person implementing the project. Two of our most recent pre-party projects took place in our dining room, where we had previously reupholstered chairs for our farmhouse table. 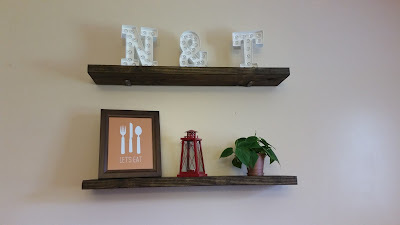 In order to have additional room for food at our Christmas party, we renovated a buffet table, and to give the space above it more character before my birthday party this year, we installed floating shelves. Mommy Suite's wood for the shelves is 2x10. When Tadd and I measured that out on our walls, we felt that it would stick out too much, so we opted for a 2x8. Everything we put on them fit perfectly. Your sanding job shouldn't take very long since hopefully your 2x8 or 2x10 (or 2xWhatever) will already be relatively smooth. Staining was also a breeze for us and only took two coats of Minwax Wood Finish in "Dark Walnut" to look sharp. We didn't use Mommy Suite's hanging method...I honestly just marked holes where Tadd asked me to, and he handled the rest. When it comes to hanging the shelves, my only advice is to have a skilled shelf-hanger on hand. I am not that person. Tadd is that person. I only became truly helpful when decoration time occurred. I used some marquee letters that I'd received as a Christmas gift from my friend Laura, a framed printout I got from Cupcake Diaries (a free download), a lantern I bought at Girlfriends and Sister Chics, and a Pothos plant that is very low maintenance and growing very well. Sand. Whether you're going to paint your table or simply apply a new stain or seal, you need to make sure that the surface is smooth. Otherwise, you may have some unsavory bumps, ridges, and the like when you begin your application process. We used an orbital sander, and it made the sanding process go by very quickly. I would like to note that we didn't do anything to the interior of the table, mainly because A) we figured few people would see it and B) we're lazy. Paint/stain. 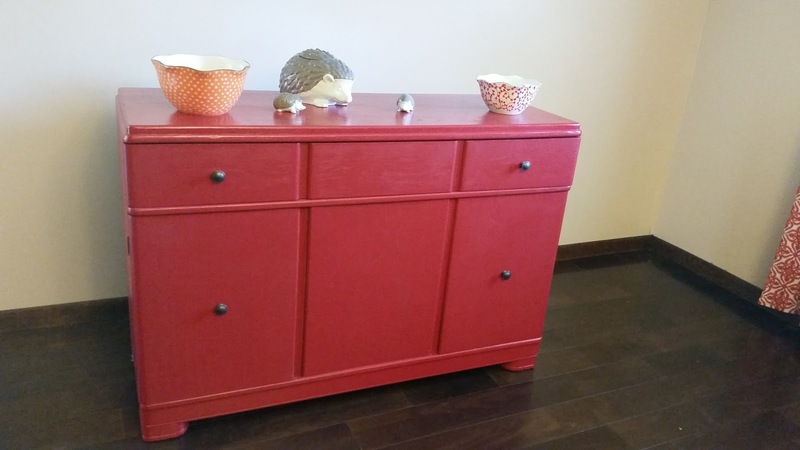 We have a red and orange color scheme in our dining room and decided to paint the table red to match. 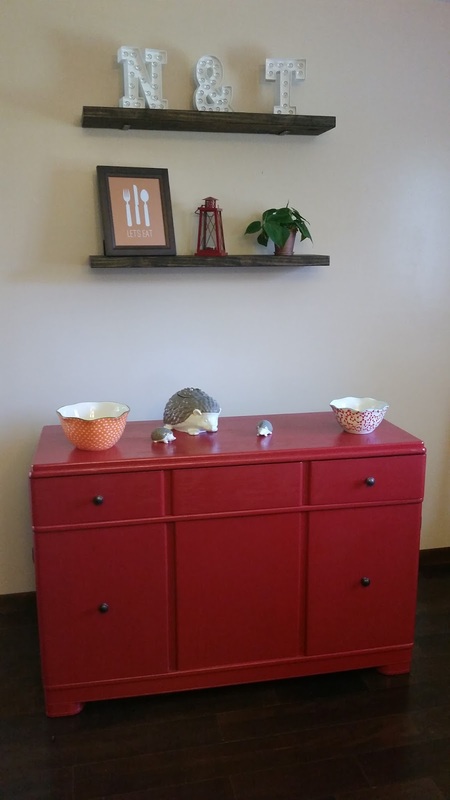 To match the red already in the dining room, we used a Valspar paint in the shade "Quite Red." The color pops but not in an obnoxious way. If we had just stained, that big aforementioned stain would have haunted me at every meal. The wood seemed to guzzle the paint, making our job a bit tougher. Even with the dark red that we used, it still took three coats of paint to sufficiently cover the table. Seal. Call us irresponsible and gluttons for re-painting in the future, but we only sealed the top of the table, using a Minwax Fast-Drying Polyurethane Clear Semi-Gloss. Our logic was that the top was the only part of the table that would see a lot of use and likely fall victim to chipping without a seal. And remember, we're lazy. Apply padding. This step is for those with sensitive floors. Our dining room floor is mega-sensitive, scratching with the least bit of provocation. We apply furniture pads to everything that rests on that floor, and it's easier to do it before you relocate the table to its final resting place. Decorate and enjoy! I chose the Pioneer Woman bowls my in-laws got me for Christmas, and the hedgehog cookie jar and salt & pepper shakers that Laura (she's a good gift-giver) got me for my birthday. When party times roll around, though, it's covered with food and drinks. With these two DIY projects combined, our dining room looks more hip and inviting. 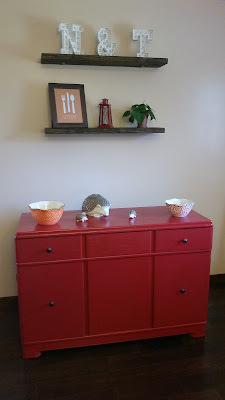 Everyone who's been to the house since we incorporated them has been impressed with how the shelves and buffet table look, so perhaps we'll tackle another similar project in the future. What would you recommend we DIY next, Hipsters? Do it yourself? More like do it yourshelf!